Judy's Corner | Sometimes hiding in a corner is the best part of my day! First of all…thank you to everyone for following Judy’s Corner! I really appreciate your support. You may have noticed that I haven’t posted anything for several months and this is due to the renaming of my blog to judy-isms. I still write about all the same things, but decided to spruce up the site and elaborate on life’s experiences and observations that never cease to amaze me! I would love for you to begin following me there so please click on over to judy-isms and hit the follow button when you get a chance. Thanks again for your support and I look forward to speaking to you from my new digs! The other day I was watching one of my favorite home improvement channels (my guilty obsession) and there he was, Vanilla Ice. But this time he wasn’t rapping his famous tune; he was renovating homes! What?! How did that happen? I’m sure some of you are wondering why this stopped me in my tracks and others are saying, don’t you still talk to him? To the latter, no! The last time I saw or spoke to the Ice Man (a.k.a. Robbie Van Winkle) was the early 90s when he was filming that critically acclaimed movie, “Cool As Ice.” I just don’t understand why the Academy passed it over for an Oscar nod. The scariest thing in this picture is my hair! To those with no idea what I’m talking about, during my days at the record company I worked for (SBK) I promoted none other than Vanilla Ice. 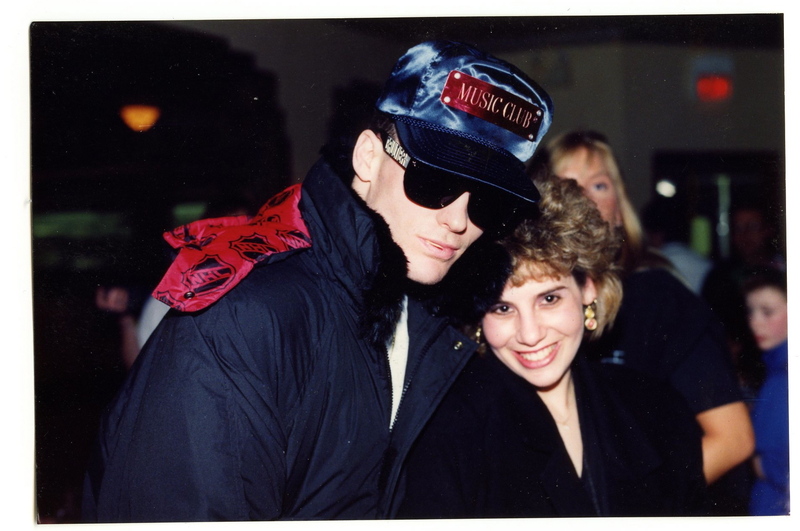 Not only did I promote him to radio stations, but I also traveled on the road with him during the “To The Extreme” tour in 1991, tour jacket and all (and yes, I still have it!). Now I was never one who wore the Jewish American Princess badge with honor so what better way to dispel the myth than to travel with Vanilla Ice and his posse…for three months…on a bus…across the country…during winter. Yo, word to your mother. And yes, I know all the words…and no, Jack will not be learning these lyrics anytime soon. You may recall that Vanilla Ice (Ice to his friends) was an overnight sensation with his white-boys-can-rap one-hit-wonder: Ice, Ice Baby. It was during this time in history that I worked with him. I remember one time in Los Angeles, after he was first signed to the record label I was assigned to drive him to the MTV Awards. He was none too pleased when I picked him up in my Honda Prelude. Well, as most of these stories go the more famous he got, the more the media dug into his past to poke holes in his story. By the time they were finished his story looked like Swiss cheese and he became a leading sketch on Saturday Night Live. Some of this had to do with bad timing because at the time of his up rise, Milli Vinilli had just been stripped of their Grammy due to lip-synching, and the media didn’t believe anyone anymore; especially a white rapper who just months earlier they were calling the next Elvis. That can never be a good thing. But I digress. So now the Ice Man is renovating homes and has his own T.V. show, The Vanilla Ice Project (and a lot of tattoos!). Good for him. He refused to let his critics (and there were a lot of them) tear him down and reduce him to nothing just because his music career was no longer what it once was (if it ever was). I do hear that he still has gigs every now and then, however (why?!). This should really be a lesson for us all in that we should leverage our strengths for greatness, like renovating homes. A recent post on Ice’s Facebook page said it best, “Always remember follow your dreams and never let negativity interfere with what you got to do – keep your head right, keep your game tight!” Do we have another hit song in the making? Why not, it worked for him with, “I’m stuck to you like white on rice,” and my all-time favorite, “Drop the zero and get with the hero!” Life lessons by Vanilla Ice – who knew? I know you’re singing along now. 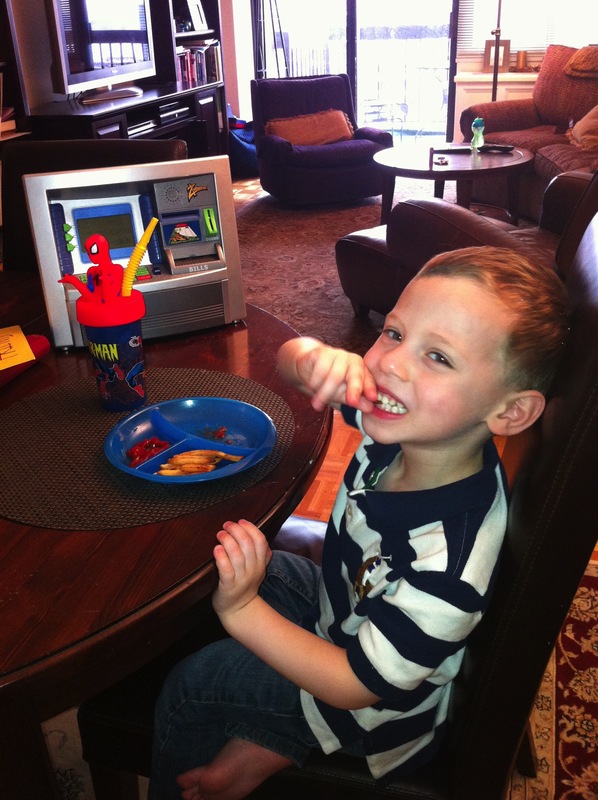 Well so is my 4-year old son…and he knows all the words! Should I be laughing or crying? As I’ve mentioned before, Jack has an incredible memory and most times he just has to hear something once and he remembers it. This is both a blessing and curse. Because I know this about him I like to point out every chance I get when he pretends to not hear, understand or remember things I say to him when it comes to his behavior. Let’s just say I have his number. So no surprise that he is beginning to remember lyrics to songs. Of course, most 4-year olds are listening to “Wheels on the Bus” and “Apples and Bananas.” (Although I actually have a friend whose son is listening to Katy Perry!) Jack listens to the classic children’s songs too, but he’s definitely moving on from that song list. I’ve always had an eclectic taste in music, probably due to my years in the radio and music industries, and my iPod reflects my choices. 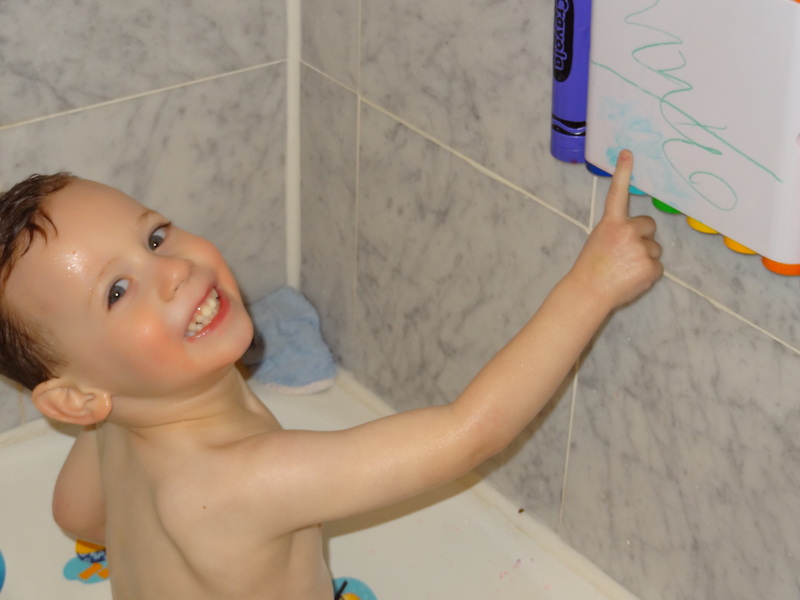 Jack mastered the inner workings of all-things electronic at a very young age. For example: he has changed the language setting on the iPhone to Spanish and keeps resetting the pass code! Now he has totally figured out how to find and select music too. His personal favorites include the Rolling Stones, Aerosmith, Genesis and lately, Jimmy Buffet. To be fair, when he was an infant we downloaded all the lullaby versions of our favorite rock and roll bands and he’s been listening to songs like “Stairway to Heaven” and “Hotel California” for years now. When he used to go into full on “I want this now” mode, I would reply by saying that you can’t always get what you want. That’s when I introduced him to the Rolling Stones. Jack and his favorite shirt! 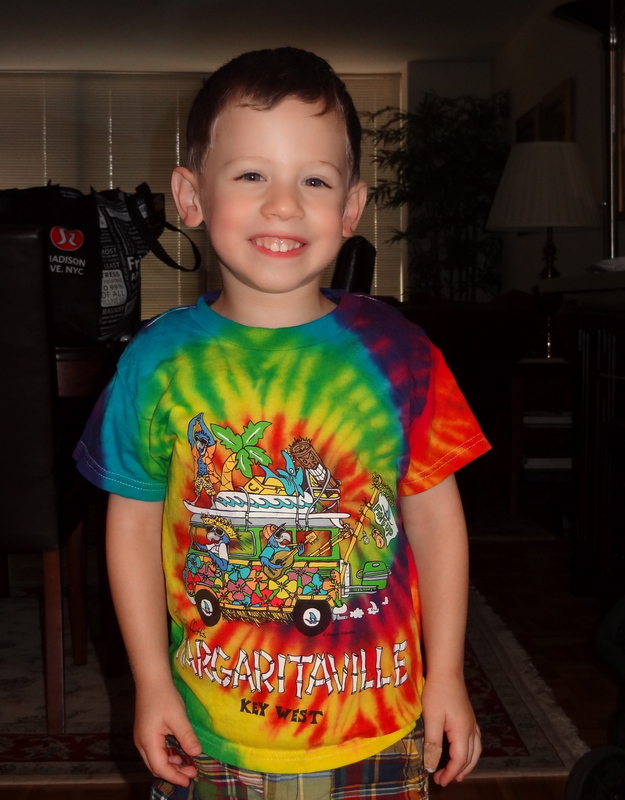 His latest obsession, however, is Margaritaville. We have had daily dance parties and sing-a-longs to the degree that I’m ready to drink a big Margarita, or take a big shot of tequila…or both. Last summer we took a vacation to Key West and you guessed it, went to Jimmy Buffet’s Margaritaville store to properly outfit Jack. This is now his favorite shirt. I guess I should be happy that he hasn’t discovered the music of today yet because like my parents with my early musical taste, I totally don’t get it! Gosh I sound like an old geezer. So for now I’ll just sit back and don’t worry…be happy! Final note – I always I thought it was, “Wasted away again in Margaritaville…,” not “Wastin’ away…!” You obviously know where my mind always was…I’m glad it took Jack to set me straight! This blog post comes with a warning label to any parents out there who will find my parenting style offensive. You’ve been warned! Having a child in my 40s means recollections of how my parents “disciplined” me are more than a distant memory now. Of course some memories never fade like having my mouth washed out with soap when I sassed back to my mother; being sent straight to my room when my sister and I decided to purposefully spill our drinks at the table; or just that stern look from my father that meant if I even thought of continuing down the path of bad behavior I probably wouldn’t sit down for a week. Aww…the good ole days. My oh my how times have changed. I’ve often told my mother that by today’s standards she and my father would probably be in jail based on their disciplinary styles from way back when. Of course, I went to school when corporal punishment was acceptable and getting in trouble in class most certainly meant a trip to the principal’s office and probable detention. Today, parents call in their lawyers and the next morning they’re all on Good Morning America pleading their case. Don’t get me wrong, there are some horrible kids out there doing horrible things. The recent story about the bullied bus monitor makes me sick at my stomach. But whatever happened to consequences and the fear of god from your parents? 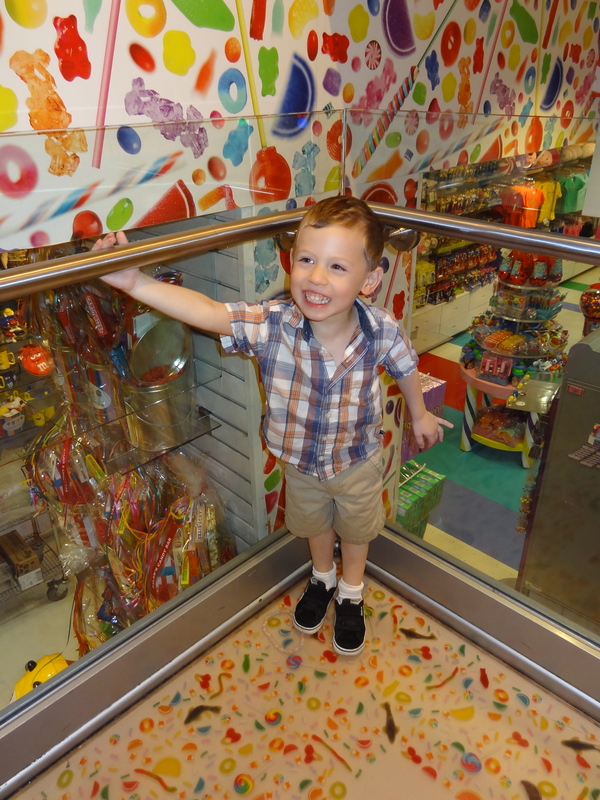 My challenges with my 4-year old are no different from most parents other than the fact that Jack thinks like an 8-year old and has the behavior of a 2-year old…and that’s on a good day. When he goes into the terrible two-year old behavior mode I react by telling him that I’m going to the store to buy him some diapers, and a bottle, and a pacifier, and a high chair. Most times that does the trick. Once when Jack was clowning around and not listening he gave himself a mild concussion because he was bouncing around in a chair and hit his head on the end table. This was a very traumatic experience for everyone as it involved a very scared little boy, worried parents…and friends, and a trip to the emergency room with hospital gowns, IVs and CT-scans. He was totally fine, by the way! Today when he starts clowning around and refuses to listen whenever I’m trying to prevent him from getting hurt, I just ask him if he wants me to call ahead to the emergency room and have them get the CT-scan machine ready. More often than not this approach usually works too. To some I’m sure that is appalling and they can’t believe a mother would talk to their child that way. But does that make me a horrible mother or one that is creatively looking for ways to teach her child right from wrong and keep him safe because the old standby of “stop-doing-that-or-you-may-get-hurt” routine doesn’t work? Jack realizing it’s good to behave and listen! Today parents are bombarded with hundreds of books, websites and experts telling us the right and wrong way to raise our children. It’s information overload! 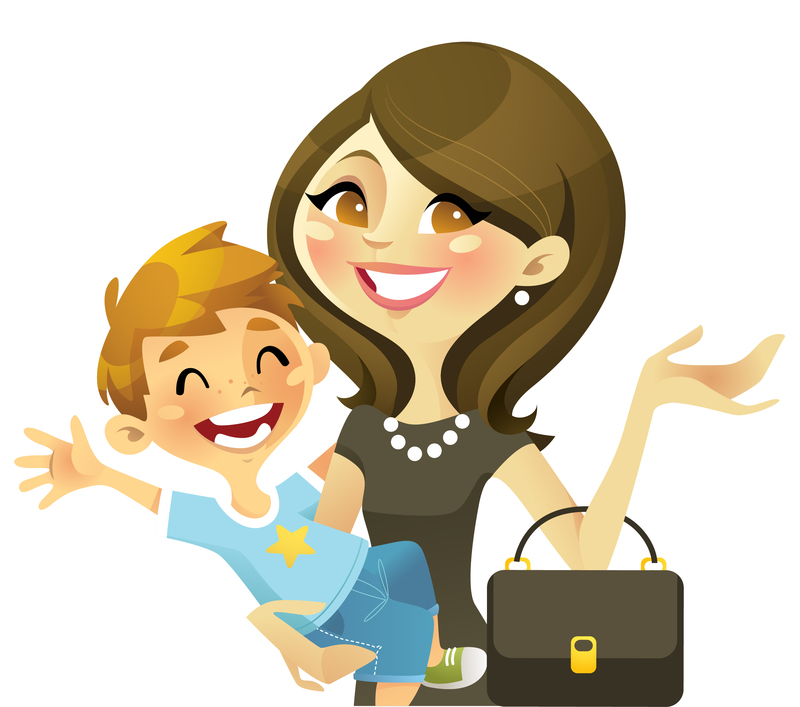 While it’s great to get perspective and differing opinions, you have to know your child and go with your gut. And if all else fails…and you feel you remotely came from a good home, and still carry the utmost respect for your parents…think about how they did it and come up with your own style. Can’t hurt, right? Living in New York City adds an extra element of fun to my parenting. Take for instance today’s behavioral episode when Jack went into full-on meltdown mode on the street, for the whole city to see and judge. Maybe it’s my 40-something wisdom or experience with the real world, but it truly didn’t faze me. I just kept on walking and knew he would eventually calm down. Of course, we passed a drugstore and I asked him if he wanted to stop in and buy some diapers. Yep, it worked like a charm! How to exhaust your kid…and be a kid again too! Today is the reason I workout! Speaking for the many supermoms I know who spend a good portion of their days chasing and schlepping kids around, this work is not for weak! Be it for school-related functions, play dates, birthday parties, doctor appointments or simply running around town, we never seem to stop moving. This requires an incredible amount of stamina (reason for working out! ), not to mention patience. 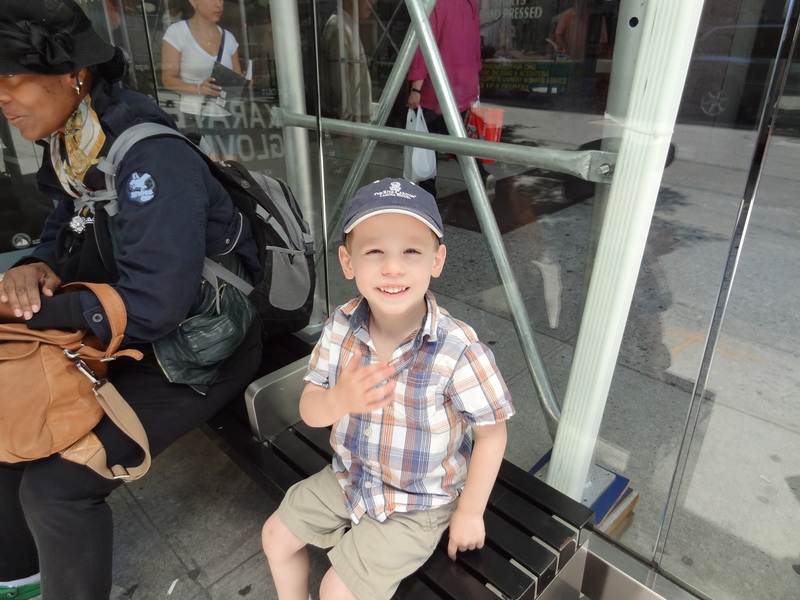 So today I’m glad I have both since my 4-year old son and I decided to play tourist around New York City. Waiting for the bus to start our day! With good weather on my side, three days before the start of summer camp, and no childcare I had to come up with a lot of activity to keep Jack busy and happy. What better way than to roam the streets of NYC and be a kid again with my favorite kid in tow. So here was our non-stop day: visited the New York Public Library to check out some books; continued on to Grand Central Terminal for a visit to the New York Transit Museum to purchase an electric toy subway car; stopped to eat lunch at Junior’s; went to Dylan’s Candy Bar for treats; and then took a ride across Central Park on a new, 3-door accordion M79 bus, the definite highlight of Jack’s day! And the day didn’t stop there. After a short pit stop we met up with friends for our weekly play date in Central Park; ate dinner out; came home and took a bath…read books…and finally went to bed! I’m not sure who was more exhausted. But like I said, this motherhood job is not for the weak…and not for a mother in her late 40s! When I used to work full-time at an office and left Jack each morning with our nanny I used to wonder who had the tougher day. I now know. 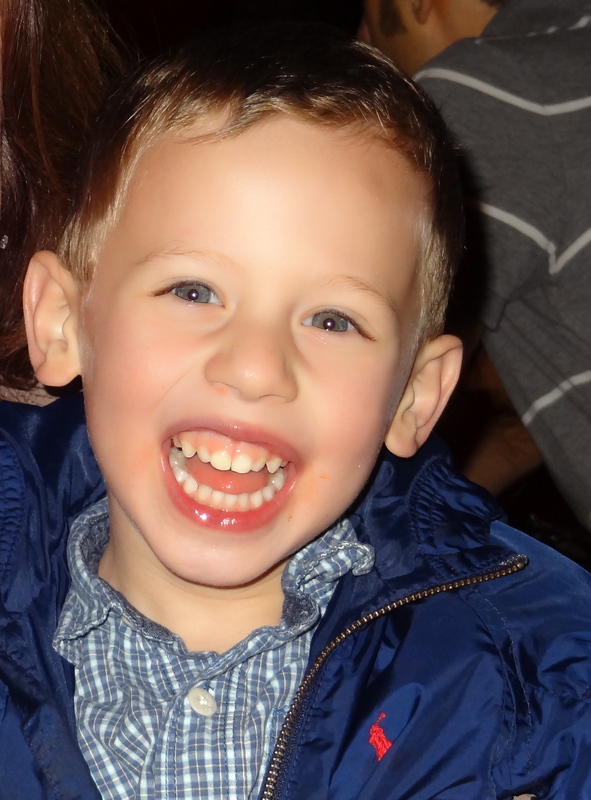 That said, there is nothing better than the face of a happy child after a fun-filled day…especially when that face is one that is fast asleep…before 8pm. Mission accomplished! Like Mother…Like Son…It really does come around! If I’m being honest, I have no filter and at times can be a tad sarcastic. Okay, maybe more than a tad. I can’t help it. I’m just too honest and tend to speak the truth a little too freely. I’ve been working on it…for years and have definitely improved my talk-before-I-think problem. This is in huge part thanks to my wonderful husband, Adam, and his many reminders to “filter” especially as we walk the streets of NYC. There’s just too much good material in this city. So no surprise, but it looks as if Jack has the beginnings of my “witty” filter challenges. 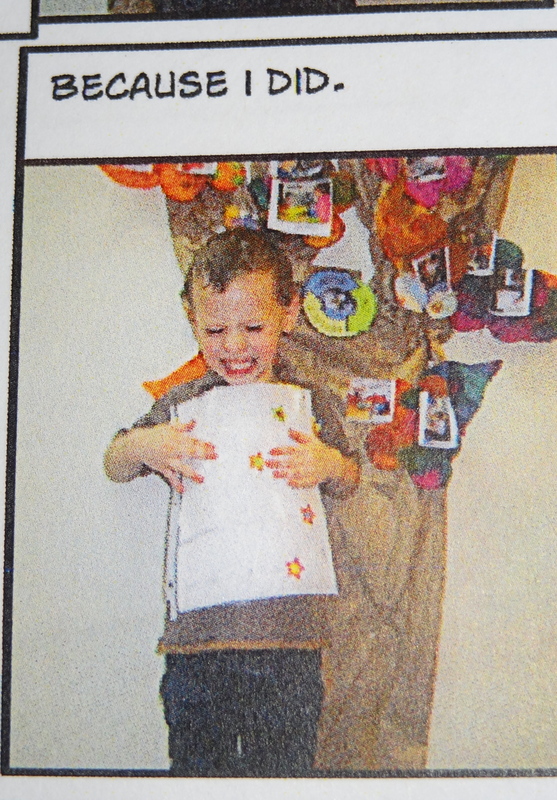 I know, he’s only four and most four-year olds are way too honest, but a mother knows! 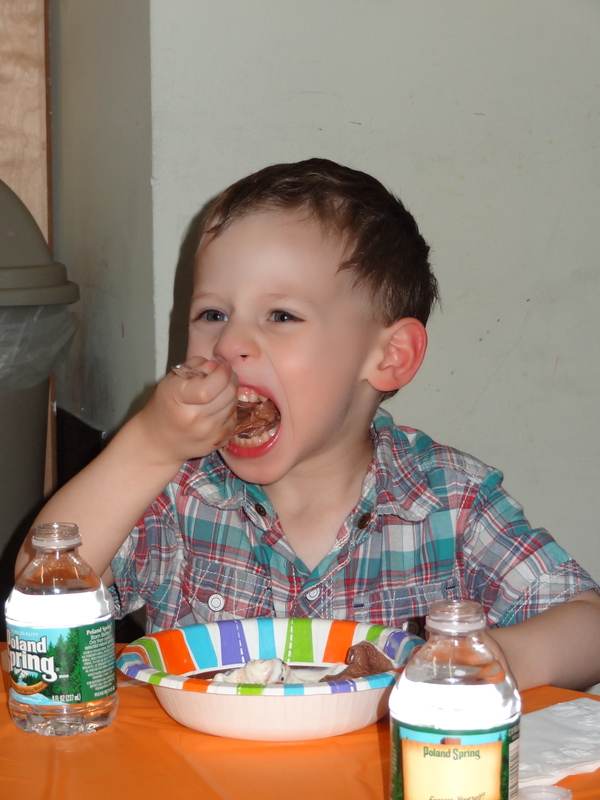 Yesterday was the end-of-school party for Jack’s class – the Brown Kangaroos at Woodside Preschool. The teachers planned an awesome send-off in the form of an ice cream sundae party. As if they aren’t hyped up enough knowing summer is around the corner, let’s give them lots of sugar and send them on their way! 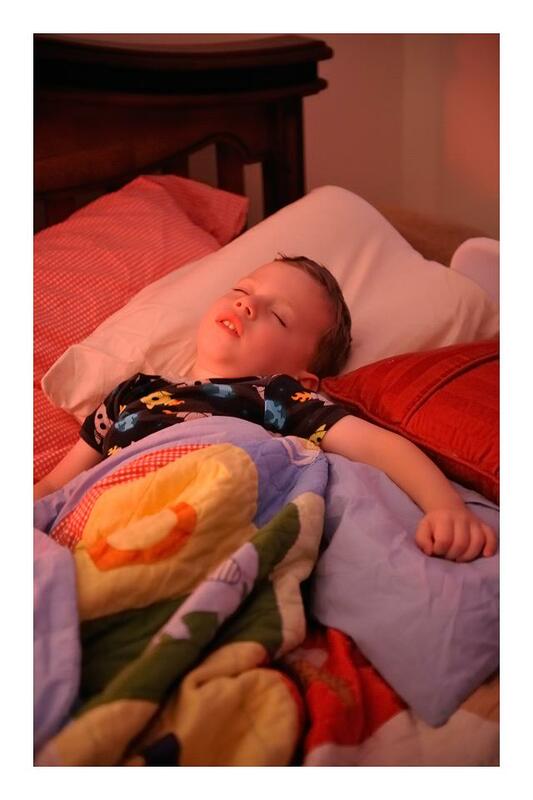 This picture says it all…sugar crash on the way! 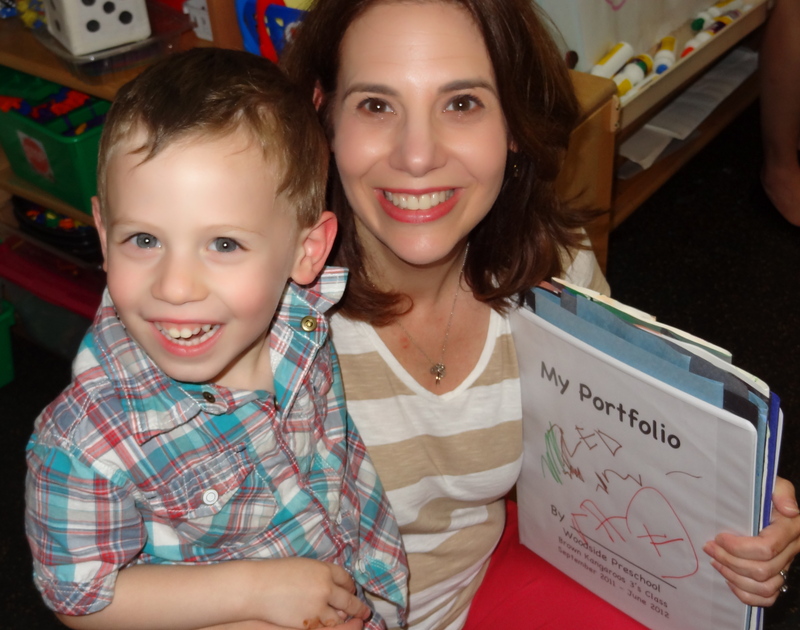 After all the singing, dancing and sugar injections, the teachers presented each parent with a portfolio of a comprehensive look back at their child’s school work from the past year. It was filled with artwork, photos and individual projects based on different topic areas. As I was flipping through the pages I had such pride seeing all the great things Jack had done throughout the year and the improvements from the beginning of the school year to now. And then I came to the page that proved to me once and for all that while Jack may look like his father, he has his mother’s smart mouth through and through. 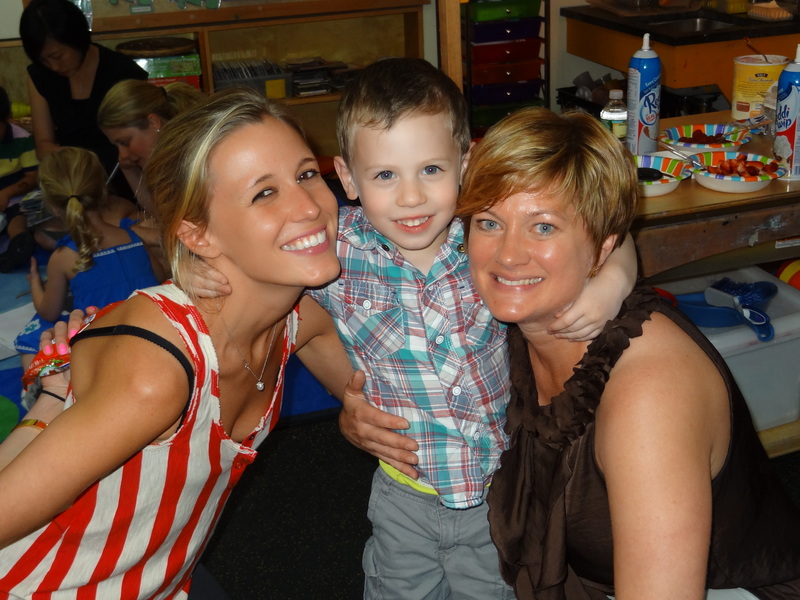 Jack with his wonderful teachers, Ms. Jena and Ms. Heidi! He’s so proud of his answer. The answers to this question had varied and appropriate responses such as: “I liked it because it’s sparkly,” “I picked this because it’s pretty,” “I picked it because I love race cars,” etc. And then there was Jack’s response: “Because I did.” There you have it…three little words that say it all…because I did. Sarcastic or way too honest? Probably both. My mother told me right before Jack was born that I would probably have a child that was just like me. She was correct. When I was in high school one of the boys’ chapters of the youth organization I belonged to hosted a beauty pageant fundraiser. My chapter nominated me to participate and let’s just say I was not thrilled. When it came time for the question portion of the show I was asked, “If you could wish for three things what would they be?” This was a real life-changing question for sure. My response: “Better grades in school, less homework and I wish this stupid thing was over.” While I got the laugh, shockingly I didn’t win the pageant. My poor mother and sister wanted to run out of the auditorium and hide. See, no filter, even back then. 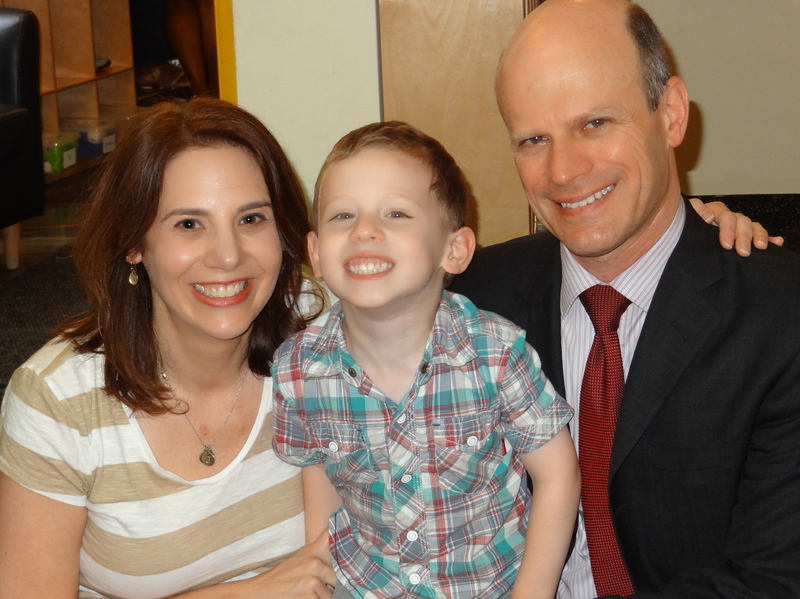 Judy, Jack and the voice of reason of the family, Adam! You can now better understand why I’m beginning to see this little part of me in Jack, but have no fear because he’s in good hands as it relates to teaching him to filter. I pledge to help him to recognize that some things are better left unsaid, that words have consequences, and that he needs to think before he talks. And if I fail in my quest, I always have Adam to remind us both!